This Englishman is 100% designer crazy! 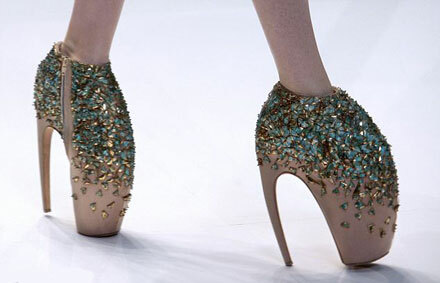 His creations have always been anything but ordinary, but the shoes from his latest Spring/Summer 2010 collection presented at Paris Fashion Week a couple of days ago are totally surreal and apparently impossible to wear. 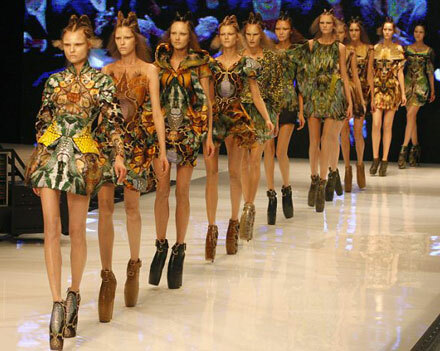 At his show inspired by Charles Darwin’s The Origin Of The Species, designer dressed his models in colorful, elaborate skins and incredible crystal-studded 12-inch-high platform shoe-boots. I can’t picture myself wearing these heels and I give thumbs ups to the catwalk models for being brave enough to wear them and keep the balance on the quite slippy catwalk. 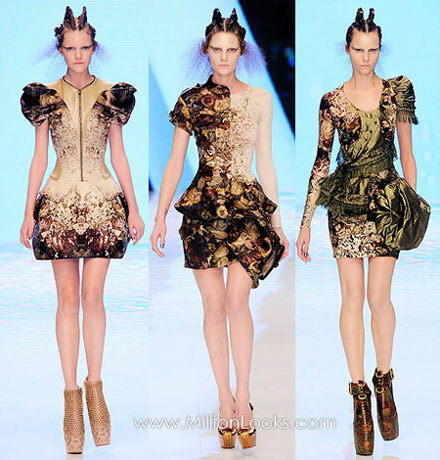 McQueen’s couture is more than just a brand, it’s a kind of fashion philosophy for style elite. Maybe that’s why the show was invite-only, though intended to be streamed online on Showstudio.com. But for Lady Gaga some 6 million fashionistas could have actually enjoyed the live catwalk show. GaGa tweeted to her fans that her latest single ‘Bad Romance’ would be premiered on the website during McQueen’s show and they could hear it there. There were so many people itching to be the first to do that that the website crashed. Prop8 ruled unconstitutional. Will Angelina Jolie and Brad Pitt marry now?